Brad is an artist living and working out of a rehabbed nineteenth century church in Granite Falls, Minnesota. 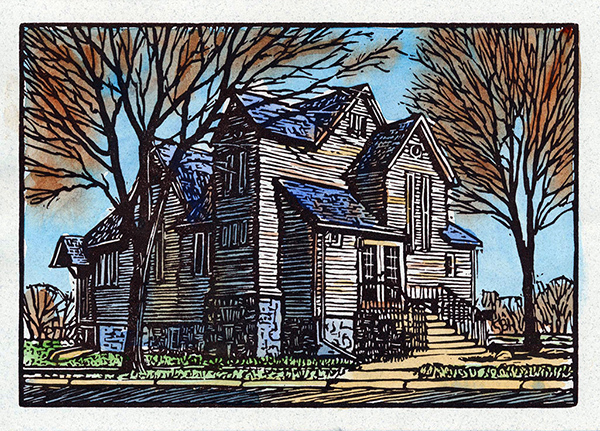 He carves and prints linoleum blocks, paints watercolors, and combines both mediums. He received the majority of his artistic training at the American Academy of Art in Chicago. He creates most of his work from reference photos taken near his home in the upper Minnesota River valley. The river valley and surrounding rural area provide significant inspiration for the artists' work. For creating the linoleum block prints the process consists of transferring a sketch onto a linoleum block from a reference photo. He then hand carves the linoleum block. The artist than prints the block with 140 lb Hot Press watercolor paper, on a 6 ½” x 10” 1957 Chandler & Price tabletop pilot press. The prints are each hand painted, signed and numbered. The artist then frames the artwork himself, with the help of his brother. He uses barn wood collected from dilapidated and abandoned farm buildings. The linoleum blocks prints are also sold as black & white greeting cards, and calendars. These are printed by hand on a motorized 1917 Chandler & Price 12” x 18” platen press by Andy Kahmann at A to Z Letterpress in Montevideo, Minnesota. He and his lovely wife Amanda participate in art fairs throughout the Midwest. Check out our Air Fair Schedule to see where we are!